The Seeport Festival – based around Captain Cook and Marsden wharves. The impact of this change and development of the city centre as a destination not just for work has been hugely positive and importantly popular too, going by the massive numbers of people drawn to the city to participate in the events. Unfortunately, a cloud continues to hang over events like what took place yesterday – and the rest of the weekend, AT’s continued sole focus on the hunt for the great white commuter (the stereotypical 9-5 office worker). This is evident by the almost non-existent public transport that existed due to public holidays being treated with a Sunday timetable – with one exception, some extra trains to cater for the cricket. But even the extra trains put on for the cricket would have been useless for most as there were only a few extra services put on at the expected start and finish time of the match. That meant throughout most of the day, the rail network continued to run with just 30 minute frequencies – a level at which most people would think makes using it just too hard. And it’s not just the infrequent services that cause issues but also how long they run for. On Sunday, and like with New Year’s Eve, the final trains for the day left just minutes before the fireworks ended. On Monday, the same thing happened with the Laneway Festival as the last trains departed Britomart just before the festival ended. To me this all represents a massive missed opportunity to showcase our PT network, which has been improving. It also likely means AT aren’t getting the most of their 99c child fares on weekends. We know that by in large, most people are rational. Many are more than happy to use PT if a decent service is provided but what AT continues to provide on days like yesterday doesn’t even come close to a decent service. This isn’t the first time I’ve raised issues about the provision PT and events and sadly I doubt it will be the last. Did you have any PT experiences over the weekend and how did they go? Public holidays were once assigned Saturday timetables albeit that was many years ago and when the bus fleet was owned by the Auckland Regional Authority, i.e. public ownership and not operated by private tendering. However AT know running the useless Sunday timetable is a problem but they do it anyway. Every year they drop the ball on the city Santa Parade. Reason for not increasing frequencies is lack of OPEX funding (yet the Regional Public Transport Plan was written the same time as the 2015 Long Term Plan) and needing Kiwi Rail to present more windows (on the Southern Line (so does not affect the Western at all)) to allow increased frequencies while there is an increase of freighters running as well. Auckland Transport to try increased frequencies next year…. First outbound train from Britomart on the Western Line has reverted back to current running (5:20am departure arriving at Henderson at 6:03am). So nothing major (and no changes to weekend frequencies) but more missed opportunities connecting up with the 380 Airporter in the early hours as well as reduced running times allowing for faster trip times. At continue to drop the ball. Ben while I agree that AT could do things better on public holidays you need to remember this is the organisation that has just spent $11M on their new building (a building that they were moving to so they could save $1M per year). 1. The first service is currently the 0506 from Puhinui followed by the 0506 from Papakura, this is not changing. 2. There will be more service to and from Puhinui but they don’t change other services, they are trains that currently run empty but will become passenger services. 3. Yes if the timetable allowed there could be a 45 minute Papakura to Britomart service but it does not. Trains can leave between six and ten minutes late from Papakura and arrive on time (or a little after) at Britomart. There is no point cutting dwell times to under 30 seconds (if and when the trains become capable of it) to then wait at any of the multiple ‘timed’ stations for departure time or get caught to close to the service you are following. I can’t comment on your claims on the western line as the only things I know that is changing out west is driver changes at Newmarket to speed up the turnaround and six minute turnarounds at Swanson. Sorry Ben I made an error with point 1, The first train from Puhinui will change from 0506 to 0507 departure and the Papakura departure has changed from 0506 to 0509 but they both still arrive at Britomart at roughly the same time they did previously. Hourly bus services on the 757/756 which often run anything from ten mins early to ten mins late meant we drove over to Orakei and took the train – on three-car sets with very little standing room. That meant instead of spending all afternoon relaxing and enjoying all the waterfront events (Tāmaki Herenga Waka Festival was also on at Viaduct) we headed home after SeePort so as to avoid the post-event crowds on the train. Absolute shambles as usual from AT. I went to the cricket by train from Swanson. We took the 9.53 departure which is the train that would best serve the 11am start at Eden Park. It did fill to sardine can standard, but no one got left behind and it ran on time, so can’t really grumble. After the game, we got to Kingsland station smartly and got onto the first / extra train, whisked in from Morningside. We were on our way probably within 25 minutes of the last ball being bowled. The train wasn’t full because they had to move it off, as people still turned up on the platform. So for our trip it worked OK.
I’m glad a decided to uber to the cricket in that case! We went to Headland Sculpture on the Gulf on Waiheke. We usually take the train from Mt Albert but went into town by car with friends instead, because of Sunday timetable. Ferry also packed to the max, not sure if Fullers had extra capacity for long weekend. Ferry home was hectic – queue out the door of the Waiheke terminal. The public holiday Sunday timetable just doesn’t suit for holidays such as Anniversary Day, Waitangj Day, Labour Day, when there are still huge numbers in the city. It’s frustrating for those of us without cars around Christmas and NY, but it can be lived with, as there generally are less users. Surely AT and ATEED can work together on this. Trains finishing before events is just ridiculous. Yes for some reason ferries were also on Sunday schedules. The excellent Seeport festival finished at 10pm, coinciding with the last ferry back to Devonport. Luckily a ferry employee saw what was going on and they delayed the trip by about 10 minutes as masses of people were trying to get home, but why did AT put on a Sunday schedule anyway on one of the city’s busiest days? Also a huge black mark to AT for locking children out of 99c fares when they are taking ferries – either make them available to all kids or don’t do it at all! there’s other overall issues at play here since Explore stopped running the route, with Fullers struggling to cope at times. I heard they make some sort of stuff up after the Fly My Pretties concert at Cable Bay on Sunday night, presumably not putting a large enough ferry on at busy times which has been a consistent problem at peak times and weekends (especially on really sunny days when lots of people come over for the day). I’ll be fair to Fullers and say they are generally pretty friendly and are trying (many would not be so charitable)…but, well, the lack of competition on this route really does mean that one ferry company is overrun at busy times. For that reason I avoid coming to Auckland on weekends if at all possible during the summer. Would be great if there was added competition on this route – this would need to be facilitated by Auckland Transport and the govt making a level playing field to attract the competition again though..which is probably a discussion for another time. AT have very little to do with ferry pricing for Devonport and Waiheke as they are both private commercial runs with no subsidy. This needs to change for Devonport, although I believe it requires legislation change. Nothing to stop AT taking 99c off of a kid’s HOP card instead of what they do now, and Fullers need not notice any difference. The legislation already allows for fare reductions, in anticipation of integrated fares, although it also specifies that the operator (Fullers) should not be subsidised by AT. When you say Fullers ‘need not notice’, do you mean AT top up the difference for a kids fare or AT pull a swifty and hope that Fullers didn’t notice? If it’s the former then it contradicts that fact they are not allowed to pay a subsidy. If it’s the latter then I think Fullers would notice pretty quickly and I don’t believe they are obliged to have Hop card readers on the commercial runs, it’s just something they choose to do and could remove if they wish. Fullers do whatever they like on the Waiheke run as there is no control imposed on them by AT. The concert stuffup is another example of what happens when there is no threat from a regulator. It seems that Ferry/Concert tickets were sold but no one appears to have thought about when the concert ended and provided sufficient ferry capacity back to the city. Fullers are one big boat down with rumours that a third engine in succession has failed catastrophically. So for Fullers it is most definitely ground hog day both in maintenance ability and timetable / capacity management. Trouble is this has been going on for 10 – 20 years. Their newest boat was off the run this morning due to ….. breakdown. There is no control imposed by AT because AT are not legally allowed to impose anything. The government, in response to lobbying from Fullers and against the submissions from AT, decided to allow the current commercially run ferry services to stay that way and outside any say from AT. It will stay that way as long as Fullers want it to (they recently gave up the commercial status of the Stanley Bay route leaving only Devonport and Waiheke as fully commercial). Along with many other Waiheke residents I am well aware of the situation with Fullers Matt L. Unlike those in the isthmus we have little choice in our transport. Don M – that’s the nature of living on an island, I imagine you knew that when you moved there or grew up there and decided it was the place to stay. When I moved to Auckland I knew I was at the mercy of the airlines (and theoretically Cook Strait ferries) to get back to the South Island to visit family. Sadly, like many people, I drove to the CBD for the long Weekend. There is more incentives to drive than to take the train. Commuters need to be treated like a costumer. AT needs to work around its customer rather than the customer working around them. This is short sighted. It is AT fretting about the farebox recovery limit at policy level, and the long held culture that is too focussed on week-day peak travel. Both are issues that need addressing at policy and culture levels. Also there seems to be some simple inertia: ‘but we always run Sunday schedules on public holidays’. Well, frankly there should be no such thing as barren Sunday schedules anyway; so outdated. No one can catch a train/bus/ferry that isn’t there. Exactly! 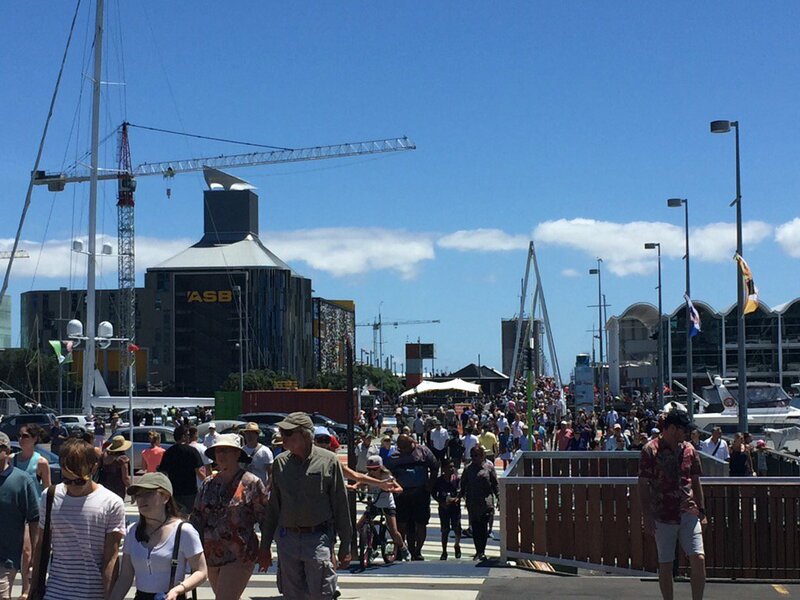 Auckland is growing fast, and becoming a vibrant seven-day-a week city. When I was a kid the inner city felt abandoned on Saturdays and Sundays, and back then these timetables might have made sense, but not any more. 1. The lack of NEX frequency on Sundays. If she’s 1 minute late for the bus, the next one is 20 minutes later and she’ll be late. Can someobody with channels into the Mayor’s office please ask him to raise this with Lester Levy promptly. It’s clear senior management are part of this long-standing problem, and that AT are not up to doing their job. I went to the cricket yesterday. A few of us came over from Waiheke on the ferry and then met up with some others – plan was probably to take an uber, but at Britomart the staff there told us that travel on the train was included in our match tickets, so we jumped on the next train which was only a few mins later. the next one was another half hour away. train was busy but not completely full, and pleasingly bypassed Newmarket and went to Grafton and Mt Eden before stopping at Kingsland. Arrived with plenty of time and without having spent any extra money on travel, really pleased with that. Then after the game, made our way quickly to Kingsland only to see a train depart only about 2/3rds full with lots of people on the platform..luckily there was another one arriving a couple of mins later – this one waited a few mins until full then also bypassed Newmarket on way to Britomart, and also included in the ticket price, so we were pretty pleased overall really. I caught the ferry to Devonport on Saturday, did Seeport\Fireworks on Sunday and Play Streets on Monday – it was the best weekend I’ve had in Auckland that I can remember – good on the council and everyone else involved. 2. Open streets… hardly open – they just closed the parking lot and the streets that cars shouldn’t have need to be on anyway – I still had to ‘deal’ with traffic coming to and from the area on my bike. I would not have done most/any of that if I had to rely on transit – it’s too much of a worry/schlep with the crappy weekend timetables (I live on lower Queen Street) and I feel bad for the people who had to drive in and out and deal with the traffic nightmare of getting home. On the other hand, bus and train drivers deserve days off too. I’m pretty sure they will still get days off even if weekend and public holidays have increased an timetable, it would just mean more drivers need to be hired, which is good for the profession. It wouldn’t surprise me if quite a few put their hands up to drive on public holidays to get the time and a half rates. That is a very relevant point Daphne L. The staffing numbers for rail are set around the current timetable taking into account rostered days off. Planning for special events is done weeks or months in advance on the hope some staff will work overtime and or using drivers usually in admin roles.. When there was a driver hire arrangement with Kiwirail there was far more flexibility, however the EMU’s are a very different machine to the freight loco’s used on the SA’s or the DMU’s they were used to. Transdev don’t have the fat in the system for much more than what they’re paid for. I expect this situation will remain status quo. Do we seriously have people trained as drivers in admin roles!? I would agree we don’t want jaded drivers, however, I think the main argument of this post is to actually increase the standard weekend timetable, but also plan well in advance for these events. This is of course possible as these events weren’t just planned last week. The answer to the first Jezza is yes, senior staff who can drive but redirect that expertise into oversight roles. Many industries do this. Staffing is such to cover budget only and virtually nothing more. OK, that makes sense. Most people here are not demanding current staff work extra hours, they are wanting AT to increase the standard weekend timetable, which would obviously require staff, and also have sufficient staff to make event timetables work. It’s worth noting that Wellington and many other cities around the world run significant extra services after events, it appears to be another case of AT thinking that this is all very complicated and there is no one else in the world running a rail network. Which they get, along with time-and-a-half for working on a public holiday. Coz, you know, the law. Of course they deserve days off, but people who work in service and supply industries can’t expect to always take those days off on public holidays. My company works for Australian and Asian clients, and we can’t shut down just because of a provincial holiday. Some of us have to work the day and take other days off instead. Read my previous comment. They have sufficient drivers to deal with M-F demand, insufficient to do the same or similar week day timetables on weekends and public holidays without staff doing overtime. And it is non negotiable that in a very highly demanding role for concentration throughout a shift, jaded drivers are dangerous drivers. There were a couple of drivers schools cancelled near the end of last year so AT must believe they have sufficient drivers already. Another reason to get driverless rail. No-one needs to get a day off. Next opportunity for Auckland is the Airport line, after that North Shore. I love the way people just casually write off another’s job to convenience themselves. If you had experience in this job, in Auckland’s setting, you would realise driverless trains would not work or be safe. I might not have experience running or operating them, but I definitely have experience riding them, and know how awesome they are from punter’s perspective. What the driverless trains actually do, is make the public transport more attractive by being frequent and responsive to expected and unexpected demand, thus increasing patronage on the whole PT network including driver-operated vehicles on that network, thus creating more jobs, not reducing them. Convenience in PT is freedom to move around. It’s a good thing. Driverless trains can work in Auckland – the whole Northern Busway is 100% ready for them. Add a tunnel (a rail one, not for cars), and you have a big chunk of our city on a driverless system. Soon after, everyone else will want it. Go travel a bit outside of NZ, and don’t use taxis, maybe then you’ll have a similar perspective on it. Having spent hundreds of millions of dollars on improving the rail service and with enormous growth of passenger numbers, surely it is time AT put more effort into improving the weekend and public holiday timetable – what is the point of organizing all these events if AT still encourage people to drive. We took our bikes into town (as did hundreds of other people) but had to make do with a train timetable that hasn’t changed since the 1950s. Surely the issues cited by AT for not increasing weekend services are not insurmountable and with some dedication on the part of AT and KiwiRail they can actually respond to issues raised by commuters. What is the point of investing in the New Network, City Rail Link, etc if AT has no real plan to make traveling on these networks any better than currently. You should be supportive and positive transportblog.co.nz AT did an incredible job with all the events. You should not cloud it with the negative – it’s disgusting. Auckland was amazing yesterday the crowd fun and the whole city buzzing. There were thousands of man hours of work to make it such a success. AT had some cool things for kids to get into bikes. So what Public transport is there for generally is to get people to essential things! Arseholes, so They always consider public holidays with less public transport. Your insult is AT did such an amazing job of creating a vibe and events, that they didn’t realise how many people would want to come.! BIG deal email them with a suggestion to put on bus’s next time. I suggest you create another post of the amazing day and so many people on bikes, planes and even Helecopters! and another post on how to get more PT on public holidays rather than try to say AT messed up. It’s disgusting and disrespectful to the thousands of hard working AT and council people making the day a success. Com-on TB you do not normally become petty. I didn’t realise it was AT who put on all of these events. I would have thought it would have been council or ATEED, or in the case of Seeport, Ports of Auckland. If AT are putting on all of these events, then why on the earth is a transport body getting into events. I don’t think anyone is criticizing the events themselves (which were fantastic) or the hardworking Council/AT staff who worked on them – AT (like many CCOs) does a lot with very little – the K Road festival is a prime example of this. Many of AT’s staff attend these events which occur on weekends and public holidays which is a sacrifice on their part. However, this does not mean that people and organizations such as Transportblog should be prevented from criticizing AT’s handling of transport, given that is AT’s role as CCO. If they improved transport options for people then it is likely that these events would run smoother and be more successful – that is hardly an unreasonable request. If AT is going to encourage people to use public transport to get to these events then it should make using public transport a desirable option and responds to the very reasonable requests of Aucklanders – having trains and buses that run more than half hourly and finish after scheduled events is not an unreasonable demand to put on AT. I think you find its ATEED doing a great job with the events, and AT failing to keep up with demand, despite constant failures to do so since before the Rugby World Cup. Imagine how much more success these events would have if people could actually get to and from them easily! Funniest comment of the year. Our (self-designated) role is to praise where praise is due and criticise where criticism is due, with supporting evidence and arguments for each. And then to host further discussion on the quality of these arguments. To only do one or the other regardless of the facts would render the effort pointless. And, in general, I’m pretty sure we largely get the balance right; not least of which because we get accused by partisan types of only doing ever hating on the one hand, and being paid to pour love on our institutions on the other! And not just of AT, but Council, NZTA, MoT, Government and other parties. We are neither a shill site, nor a partisan hating one. I know this confuses people with fixed views, whether in our institutions or in other corners of the web like permanently left or right wing political players, but that’s how it is. And that’s our strength. We offer no blind support to any player in the field, nor will we always oppose anyone. Any individual or institution that does a good or poor thing in the city building space in NZ (especially Akl) is likely to get our attention. Happily, since we began, the balance by almost all players in this broad field, including AT, has shifted more to the positive side of the ledger than the negative, and that trend is, if anything, accelerating. But we have high standards, so are unlikely to not find room for improvement now and in the future. One last point; to criticise is to love. We criticise in order to try to improve. And what do we love? This city. We make all this effort in order to get better outcomes for this city and all its inhabitants, a place we are united in believing is full of potential to be so much better, especially with the kinds of changes we promote. And especially by changes in approach by those charged with serving the city. After all who else should be doing this other than those in these positions? I stayed at home reading a book under the shade of a tree not bothering to leave the yard at all except to take a bike ride to the dairy. Had I bothered to go anywhere I would have taken the car. Auckland is always so nice when half of us are off causing traffic in other parts of the country. PT makes no sense when you have a family. They should make Sunday “Free PT” day to get people to try it out. 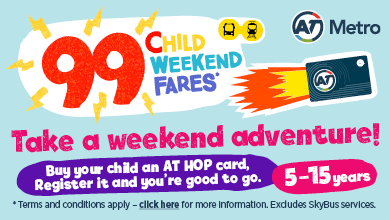 With 99c child fares on a sunday, it almost is free. We went to Waiheke yesterday. Left the car at the Panmure park n ride. Fortunately good train connections both ways, but with a 30 minute frequency it could have been very tiring. The Waiheke ferries & Waiheke buses were brilliant! But with the closure of the Downtown mall and the shops at Britomart its rather hard to find refreshments en route to/from ferry. Why cannot the weekend frequencies be almost as good as weekdays (less the peak hour extras)? We went to the Seeport Concert and Fireworks on Sunday evening. Caught the train both ways. Worked really well. My only criticism is that there was quite a bit of uncertainty over the availability of a train home. The Sunday timetable showed the last Southern line train as departing at 9:28pm, which was well before the concert finishing time of about 9:45pm. The AT Metro Journey Planner app gave conflicting results – at times indicating that there was a later train and at others saying nothing available. We decided to walk back to Britomart and check, and found there was a 10:28pm departure, so caught that. AT is run by bureaucrats who doesn’t care. Still no frequency improvements and still the dreaded 10PM train curfew for most of the week. Have to have a car to anything fun late in Aucks. Patronage rise surely should justify improvement to the hours of operation, yet we still haven’t seen squat improvement to finish times in years.